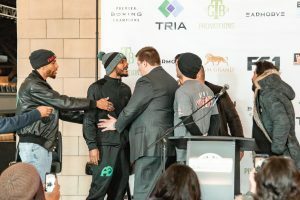 Both Anthony Dirrell (32-1-1, 24 KOs) and Avni Yildirim (21-1, 12 KOs) will be looking to crown themselves champion this Saturday night when they meet for the vacant WBC Super Middleweight title at the Minneapolis Armory in Minnesota. For Dirrell he will finally get his chance to claim the title he dropped in 2015 at the hands of Badou Jack by majority decision. Since that defeat Dirrell has gone on to win five straight contests with three of those wins coming via stoppage. Dirrell was originally in play to challenge then champion David Benavidez until a failed drug test saw him get striped of his title. Make no mistake about it Benavidez will have a close eye on the winner of this contest as he will be itching to get a shot at the title in the very near future. For both Dirrell and Yildirim they represent the total opposite of one another in every way. Standing a six feet two inches, the former champion will have a decided three inch height advantage to go along with a four inch reach advantage as well. Dirrell has always been a very good boxer, establishing a great jab to break his opponents down before using his underrated power to put an end to the proceedings. Yildirim on the other hand is a bull. Always coming forward and willing to take a few shots in order to land a few of his own. At age 34 and having fought just once in 2018 Dirrell has made it clear that this contest could be his last before he decides to hang them up for good. For Yildirim he will be looking to keep his five fight win streak alive. In 2018 alone he made four ring appearances and continued to look better and better each time out. This will be his second attempt at a world title since losing to Chris Eubank Jr in 2017 for his lightly regarded IBO title. If this is truly the last fight for Dirrell then he will be looking to leave the sport of boxing on a high note while Yildirim will be looking to establish himself as a force in the division. A loss for Yildirim will undoubtedly place him at the bottom of the ladder. Expect both fighters to swing for the fences and give it everything they’ve got. Although there won’t be any titles on the line in the co main event both Janer Gonzalez (19-1-1, 15 KOs) and Jamal James (24-1, 11 KOs) are hoping that they can place themselves in the championship hunt in the stacked Welterweight division with a win. Gonzalez has been out of the ring since a 2017 loss at the hands of Radzhab Butaev. Gonzalez won’t be given any favors in his return bout as James will be looking to extend his current four fight win streak since losing at the hands of Yordenis Ugas. That streak has included impressive victories including a third round stoppage win over former WBA interim Welterweight champion Diego Chaves. James is tall for the division and has a mean streak when he gets his opponents hurt. His climb up the rankings has been eye catching as well. He may not be a house hold name but with a few more impressive victories he can change that. Both fights from Minneapolis are sure to produce a ton of fireworks as fans assuredly won’t want to miss the action live on FS1.